Give graphene a diamond and you’ll get a flower in return. Researchers have found that poking a sheet of atom-thick graphene with a diamond tool causes tiny ribbons to peel away from the surface, like flower petals opening. “I don’t think anyone ever expected it,” says Graham Cross at Trinity College Dublin, Ireland, whose team made the discovery. Graphene sheets, which are made of a single layer of carbon atoms, are both superstrong and highly flexible. 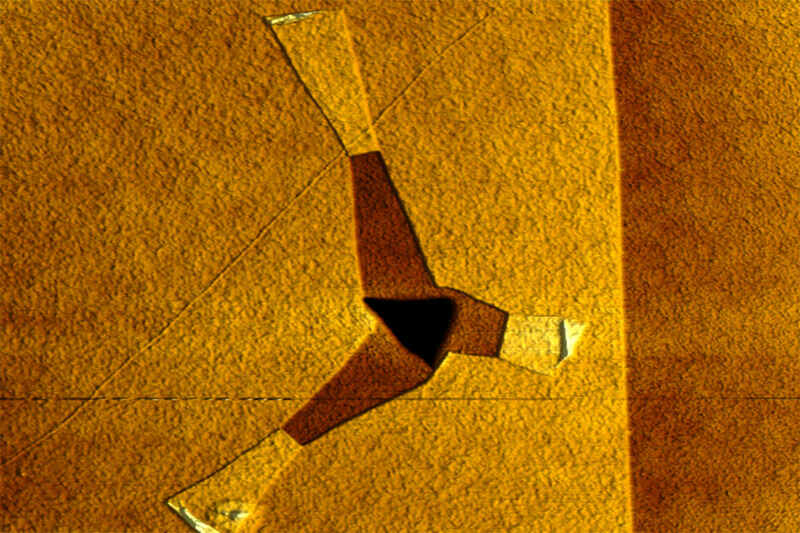 Other researchers have folded graphene into origami shapes using chemical reactions and tiny tools, but no one knew that a little prompting could cause graphene to tear and fold itself on its own. The find was an accident, discovered when the researchers were conducting an experiment to measure the friction of graphene by piercing it. Once their diamond tip punctured the sheet, they found that the energy from ambient heat was enough to cause the ribbons to keep tearing and unfolding into a tapered strip in less than a minute. “What for me is extraordinary is that it tears,” says Annalisa Fasolino at Radboud University in Nijmegen, the Netherlands. The atoms in a graphene sheet are bonded tightly, but there is only a weak attraction between sheets when stacked, she says. However, the researchers showed that after a layer started to tear, the weak attraction between the bottom of an unfolding ribbon and the sheet below was enough for the sheet’s internal bonds to keep ripping. By changing the initial width of the tear, the researchers could control the length of the resulting ribbons, which tended to grow five times their initial width. “We’ve done crumpling, wrinkling and tearing of thin sheets, even one-atom-thin sheets like graphene, but not with such exquisite control,” says Scott Bunch at Boston University. 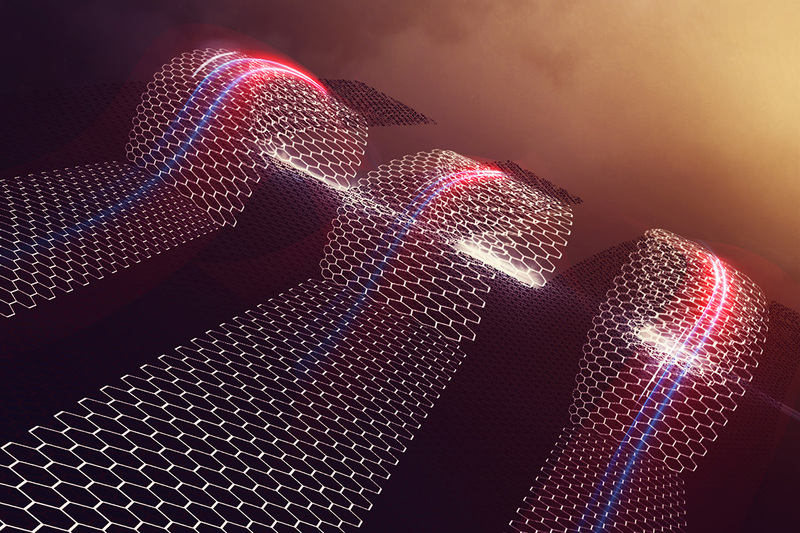 Graphene’s peculiar self-folding ability could be a big help in making better electronics, says Cross. By setting off ribbon formation in careful patterns, the sheets could be folded to make tiny sensors and even transistors. Such devices could allow for nanoscale electronics and fast-processing computers. “It would take a bit of work to do that, but it might be able to,” he says. Engineers could also prepare the sheets to tear at specific temperatures, says Cross. This could help in the food industry – for example, a graphene-based sensor on packaging could break a circuit if an item’s temperature rose above a safe level. Itai Cohen at Cornell University in Ithaca, New York, does not think graphene will replace silicon in electronic chips, but says graphene sheets could be used to manufacture very small robots. “Folding atomically thin sheets like graphene is a way of packing many, many features into a small 3D volume,” he says.